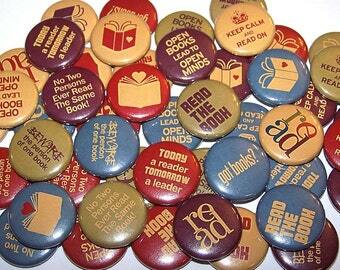 Set of 10 assorted reading and book phrases theme buttons. 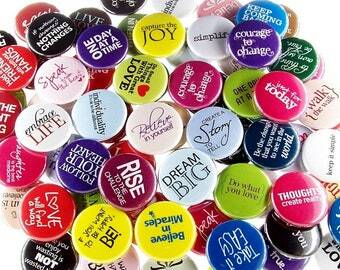 You will receive 10 buttons randomly selected from the assortment shown in photo. • Pin Backs: Pins on back for wearing on clothing. • Fridge Magnets: Magnets for decorative use - not for wearing. 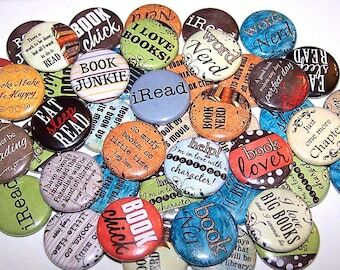 Buttons are great for so many uses! Party favors, table confetti, rewards, stocking stuffers, pin it on your purse, backpack, hat, etc! Also a great alternative to bottle caps. Want a different quantity or want to mix and match sets? Custom orders are welcome! Quick shipping service. 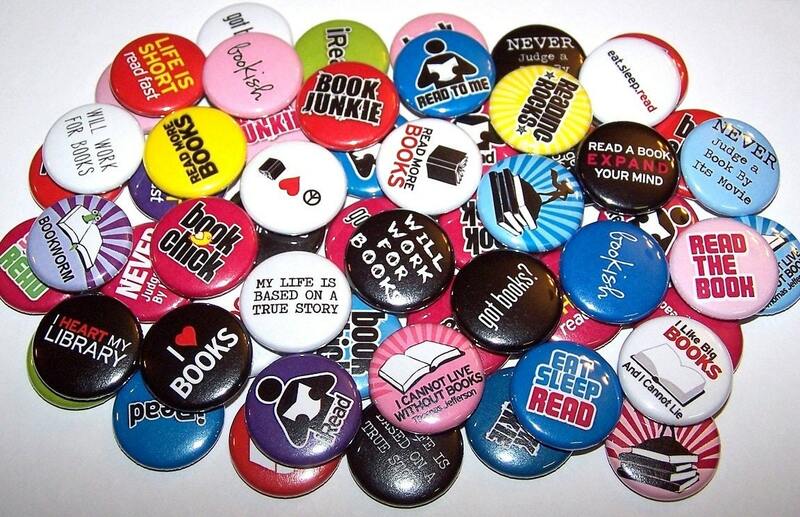 Loved the assorted buttons. All major credit cards are accepted directly through Etsy or payment can be made via Paypal. Customer satisfaction is our priority and we are confident you will be completely satisfied with your purchase. We try to represent our work & product as accurately as possible. However, if you are dissatisfied with your order, please contact us. We'd greatly appreciate the opportunity to discuss any issues with your purchase. Returns are accepted. However, customized & personalized orders are non-refundable. In the event a return is required: Shipping expenses are non-refundable. Packages must be returned in complete & new condition within 21 days of receipt. In the event items are damaged when received: Photographs of damages are required upon receipt for refund or replacement. In the event an incorrect address was provided for delivery: Packages shipped as directed & scanned with a "Delivered" status by USPS are not eligible for refunds or replacement. In some cases, the packages are returned. If returned, you may request a refund less shipping or request re-shipment to the correct address at your expense. In the event your package is lost during transit: Your order will be replaced or refunded with the execution of an official lost parcel affidavit by the buyer. USA orders are considered lost after 21 days. International orders are considered lost after 60 days. Packages shipped as directed & scanned with a "Delivered" status by USPS are not eligible as a lost parcel for refunds or replacement. Orders are shipped to the address provided on your Etsy invoice. Please contact us immediately prior to shipment if the address needs to be corrected. Please allow up to 3-5 days to prepare your order for shipment. All shipping quotes are based on USPS's average performance and should only be considered estimated as they can vary. How long does it take to receive my order with standard shipping? Please allow 3-5 days before your order ships. Then, please allow a minimum of 4-7 additional business days before delivery. Shipping quotes are based on USPS's average performance and should only be considered estimated as they can vary. Standard shipping is USPS First Class. Upgrade shipping options are available during check out for USA orders. How fast is upgraded Priority or Express shipping service? Please allow 3-5 days before your order ships. Then, please allow a minimum of 4-7 additional business days before delivery. Faster upgrade shipping service is available during check out for USA orders. Priority averages 2-4 business days after shipment. Express averages 1-2 business days after shipment. Shipping quotes are estimated & can vary. What size are the buttons? I carry 3 sizes of buttons in my shop. 1" mini pins, 1.5" pins, and 2.25" pins. Not all sizes are available for every item. The available sizes will be stated in the item description. A photo demonstrating the sizes are also shown in each listing. Can I choose from the buttons shown? Can I request to include or exclude certain buttons shown? Yes! During check out there will be a box for notes to seller. There you can leave any special instructions for your order from the designs shown in the photos. If no notes are left, the buttons are sent as described in the item details. We are not accepting international orders at this time. Can you make custom designs, change colors, personalize, etc? We are not accepting custom orders at this time. Can I get a different quantity? Yes! We can make a custom listing for any quantity that you need. Please contact us to discuss.